Early 1960s photo of Bill Medley & Bobby Hatfield on a 2006 issue two-CD set. Among songs included is the No.1 hit of 1965, 'You've Lost That Lovin' Feelin' '. Click for CD. In December 1964, a song titled “You’ve Lost That Lovin’ Feelin'” began to be heard on the radio. It was a song that would one day become the 20th century’s “most played” radio song. It was performed by two guys from California — Bill Medley and Bobby Hatfield; two guys who came to be known as the Righteous Brothers. Their stage name came about after a black U.S. Marine, attending one of their early nightclub acts, shouted out approvingly: “That was righteous, brothers!” The label stuck, and the two singers became a distinctive duet, with Bill Medley, the taller of the two, providing the bass-baritone, and blond-haired Bobby Hatfield singing tenor. Their style would later be dubbed “blue-eyed soul,” and there was no doubt about their vocal talent. They had a range and style that helped create a strong and distinctive sound. But they also had another potent ingredient in their music that helped make it distinctive — a music producer named Phil Spector. Regarded as a musical genius in the studio, Phil Spector was then coming into his most productive years. With the Righteous Brothers, Spector made especially good use of their talents, packaging their songs in a distinctive way as he pushed the boundaries of popular music using his then-becoming-famous “wall of sound” technique. Spector’s sound used a flood of instrumentation behind good vocals that gave pop music a near-orchestral quality. His treatments became quite distinctive, often described as “full and powerful”; they changed popular music. "You've Lost That Lovin' Feelin', on Spector's Philles label. Spector himself, however, would also become known for his quirky and bizarre behavior, some of it violent, which years later would result in a second-degree murder conviction in the Los Angeles case of actress Lana Clarkson, for which Spector is currently serving a 19-years-to-life prison sentence. But in his earlier life, during his 1960s’ music production and studio work with the Righteous Brothers and other groups, Spector had magical abilities and was a much sought-after producer. 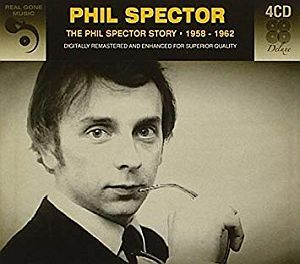 Phil Spector as he appeared in the 1960s, here on the cover of a collection of his songs. Click for comparable collection. To get up to the really high notes in the song — a song, it would turn out, that builds and builds — there had to be a low start, so they kept experimenting to find just the right start and voice. In the end, what had begun with Mann and Spector at the piano with their high, thin sound, became something very different — but in a good way. “The whole vibe of the song” changed, explained Bill Medley. But he credits “Spector’s phenomenal production” for making a song that was pretty unique. “Great song! Great production! And I think Bobby and I did a real good job.” Spector also had some back-up singers on the song, namely Sonny & Cher, before they hit it big on their own. Righteous Brothers, 1960s. Bill Medley & Bobby Hatfield, in younger days. 45 rpm version of 1965's ‘Unchained Melody’ on Phil Spector’s label. Click for 3-song CD. Before the Righteous Brothers scored big with “You’ve Lost That Lovin’ Feelin’,” the two had performed on the September 1964 premiere of ABC-TV’s rock `n roll variety show, Shindig!, and they continued to make appearances on the show thereafter. They had also served as an opening act for the Beatles’ first America concert tour and later for the Rolling Stones as well. But once their songs began climbing the charts, they were soon in demand for their own act. The Righteous Brothers’s sound, however, had fooled some listeners in the mid-1960s, including a few in the black community thinking the two singers were black artists. Black music was also then called “rhythm & blues,” or R&B music, having been changed from the previous “race records” label of earlier times. In the 1960s, a number of cities with R&B radio stations were surprised to learn that the Righteous Brothers’ songs were those of two white performers. Rocky Grosse, Program Director at WWRL, a major R&B station in New York, was one of those with the mistaken impression. George Woods, an on-air radio personality with WDAS in Philadelphia, is credited with coining the term “blue-eyed soul” to describe the kind of music these two white Righteous Brothers were then turning out — music enjoyed by both R&B and pop listeners. In fact, the Righteous Brothers songs helped open up the R&B radio stations to other white artists who also had a “soul sound” to their music. By 1966 the Righteous Brothers left Phil Spector and the Philles label, making a better business deal with Verve Records. Verve bought the Righteous Brothers’ contract for $1 million. Their first song with Verve, “(You’re My) Soul and Inspiration” was also a No. 1 hit and a million seller. Bill Medley, who had some experience with sound production, was able to replicate a Spector-like “Wall of Sound” treatment for the duo’s new song. Through the remaining 1960s, however, they would have only a few more Top 40 hits. In 1968, Medley left for a solo career. Hatfield kept the Righteous Brothers going for a time with another singer, Jimmy Walker. But the act wasn’t the same. Medley had a couple of hits on his own, and for a time, neither he nor Hatfield did alone what they had done together. In 1974 they reunited for one hit, “Rock and Roll Heaven,” and in later years did some touring together on the oldies circuit and nightclub performing in Las Vegas and elsewhere. The Righteous Brothers’ ‘Unchained Melody’ helped make the ‘pottery scene’ from the 1990 film ‘Ghost’ one of the most memorable ever – and the film's popularity gave the song & Righteous Brothers’ music new life. Click for film DVD. However, two of the Righteous Brothers’ 1960s songs would later receive a boost from subsequent use in major films. “You’ve Lost That Lovin’ Feelin’ ” received a second run at the music charts in 1986 after it was used on the soundtrack of the May 1986 movie, Top Gun, starring Tom Cruise. In 1990, the Righteous Brothers’ “Unchained Melody,” featuring Bobby Hatfield, was used memorably in the Patrick Swayze-Demi Moore film Ghost, rising to No. 14 on the pop charts and becoming a million seller more than 25 years after its first recording. “Unchained Melody” also then topped the U.S. adult contemporary chart for 2 weeks and was No.1 in Australia for 7 weeks through January 1991. In the U.K., meanwhile, “You’ve Lost That Lovin’ Feelin'” became the only song to enter the UK Top Ten three different times: once in 1965 when it was originally released, again in 1969 when it was re-released, and a third time in 1990 following Ghost, when “Unchained Melody’s” rise to No. 1 there also brought attention to “You’ve Lost That Lovin’ Feelin,'” which itself rose to No. 3 on the UK charts. “Unchained Melody,” however, was the best-selling UK single that year. In the U.S., a 1990 anthology album, Best of the Righteous Brothers, also became a million seller. In 2004, the American Film Institute listed “Unchained Melody” at No. 27 on AFI’s 100 Years…100 Songs survey of top songs in American films. In 1987, Bill Medley, separately, had a No.1 hit with Jennifer Warnes used in the film "Dirty Dancing". “Unchained Melody” is actually a song first written and recorded in 1955 when it was used in the film Unchained. It has since been covered extensively, with some 1,500 recordings, in multiple languages, made by more than 670 artists. However, the Righteous Brothers version from 1965 featuring Bobby Hatfield, who changed wording in one of the song’s later lines to “I need your love,” has become the classic. 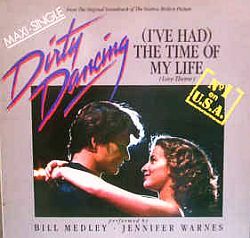 Separately, in 1987, Bill Medley’s duet with Jennifer Warnes on “(I’ve Had) The Time of My Life” — a featured song in the film Dirty Dancing — topped the Billboard Hot 100 that November, and later earned a Grammy Award. The film’s soundtrack, with the song, also became a gigantic best seller — in fact, the most successful soundtrack since Saturday Night Fever, selling 14 million copies. The Righteous Brothers’ songs have been covered by a number of groups. Elvis Presley, for one, frequently sang “You’ve Lost That Lovin’ Feelin'” and “Unchained Melody” during his 1970s performances. Dionne Warwick, Hall and Oates, and Neil Diamond, among others, have also done versions of “You’ve Lost That Lovin’ Feelin’.” Warwick’s version hit #16 in 1969, and Hall and Oates’ remake hit #12 in 1980. …Naturally, I bought the record, surprised at its red and yellow Philles label… So I sat and stared at the label and being in another line of work at the time — eighth grade — came to no unnecessary conclusions.. . . In the spring of 1987, staying at a hotel in downtown Chicago, I strapped on headphones and went for a run. . . I’d been on the road a couple of weeks, and felt home- sick, a little afraid, frightfully lonely. . . 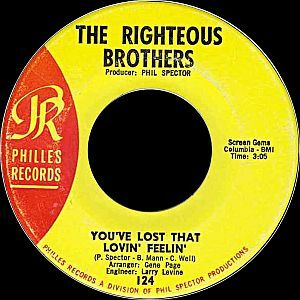 I loved the record (wore out one copy, picked up another used), harbored a half-secret devotion to the Righteous Brothers no matter what they did well into adulthood, moved on to other things, but still turned “Lovin’ Feelin'” way up whenever it came across the radio. In the spring of 1987, staying at a hotel in downtown Chicago, I strapped on headphones and went for a run. There was a parade on Michigan Avenue, and I dodged in and out among the crowd until I got down by the lake, where there was almost nobody. I’d been on the road a couple of weeks, and felt homesick, a little afraid, frightfully lonely. The tape I listened to was composed of random favorites, deliberately jumbled so I couldn’t remember what came next. Somewhere over by the lake, “Lovin’ Feelin'” came on. I jammed the volume all the way up and the clash of those voices came through again. When they started begging and pleading — “Baby, baby, I’d get down on my knees for you,” sang Medley, “If you would only love me like you used to do,” responded Hatfield — tears sprang from my eyes. In the center of the continent, at the heart of a population of six million, I was suddenly, unmistakably, nerve-tinglingly abandoned and alone. Righteous Brothers performing in later years. During the 1990s and early 2000s, the Righteous Brothers were sometimes performing 60-80 shows a year on the road and in concert. They were also appearing in Las Vegas for about 12 weeks a year. But in 2003, they were recognized for their earlier contributions to rock ‘n roll music. On March 10, 2003, they were inducted into the Rock and Roll Hall of Fame. Billy Joel was their presenter. “In the mid-1960s the Righteous Brothers became a fixture on Top 40 radio and the televised rock and roll variety show Shindig!…,” says their Hall of Fame description. “Medley’s commanding baritone and Hatfield’s forceful tenor ranked among the most indelible voices of that charmed era.” But sadly, only several months after their Hall of Fame induction, tragedy struck, as Bobby Hatfield died suddenly in November 2003 during one of their tours. He was 63 years old. In 2008, an earlier 21st anniversary special on the Righteous Brothers’ music that had been filmed in 1983 at the Roxy in Los Angeles, was aired nationally on many PBS television stations. 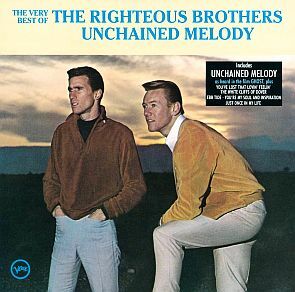 "The Very Best of the Righteous Brothers" on Verve, featuring "Unchained Melody". Cover of 1999 CD with 'You've Lost That Lovin' Feelin'. “The Righteous Brothers,” in Holly George-Warren and Patricia Roman- owski (eds), The Rolling Stone Encyclopedia of Rock & Roll, Rolling Stone Press, New York, 3rd Edition, 2001, p. 824. “The Interview” (1996), Righteous Brothers Official Website. “You’ve Lost That Lovin’ Feelin’, The Righteous Brothers,” Rolling Stone, December 9, 2004. “BMI Announces Top 100 Songs of the Century – ‘You’ve Lost That Lovin’ Feelin’ ‘ Is Number One,” BMI.com, December 13, 1999. Dave Marsh, The Heart Of Rock & Soul: The 1001 Greatest Singles Ever Made, New York: Da Capo Press, 1999. pp.7-8. Dave Thompson, “You’ve Lost That Lovin’ Feelin’ by The Righteous Brothers,” Song Review, All Music Review. “You’ve Lost That Lovin’ Feelin’” and “The Righteous Brothers,” Wikipedia.org. Richie Unterberger, “The Righteous Brothers,” Biography, All Music Review. “Blue-Eyed Artists Herald Musical Integration of Airways,” Billboard, 1960s. “You’ve Lost That Lovin’ Feelin’ by The Righteous Brothers,” Songfacts.com. “America’s Greatest Music in the Movies,” AFI’s 100 Years…100 Songs, American Film Institute, June 2004.